There is a mysterious unused alernate CRC for each track in AccurateRip database, and i suppose it's a CRC of some fragment of a track. How are you calculating offsets, exactly? Correct AR has 2 CRCs one for the track, the other for 1 sector in the track for offset detection. If there is an offset by S samples, original ArCRC = sum ( (N-S) * Sample[N] ). sum ( (N-S) * Sample[N] ) = sum ( N * Sample[N] ) - S * sum ( Sample[N] ) = ArCRC - S * OcCRC. We do it for every S in range of +- 5 frames, and search for the match. So we don't really need that second CRC from the database to find an offset for a correctly ripped track. Of course, in practice it's all a bit more complicated around the track boundaries. @spoon: Is there a way to query the AccurateRip database via the web to get a list of AccurateRip Disc IDs that correspond to/contain a certain FreeDB Disc ID? This would allow us to determine the AccurateRip Disc ID for a CD with a data track if the cuesheet contained a "REM DISCID" line. In fact, it's even possible to do this now since the length of the data track can be determined to within a 1 second range based on the FreeDB Disc ID, but I'm sure you don't want us querying 75 times (max) to figure out which one is correct. Maybe that is why I haven't really tried "Fix offset" option yet and lack for autoverification after conversion. If AR knows about different pressing only but I'm sure the rip is offset corrected, I wouldn't adjust it to AR, only convert image to tracks (I like it that way) and verify result. But here's another strange one. Can you implement an "Encode if AR verify OK" mode ? You could even have a setting to specify the confidence level of an OK AR verification, say for example, 5 (i.e. : if confidence level is >=5, then flag it as OK). An album should be considered AR OK if all tracks verify with the same offset, over the previously specified treshold. I hope the new version does what you need. You can turn on "Encode only if" option in Avanced settings, set up the confidence levels, turn off offset correction if you like, and run it in "Fix offset" mode. I think I have the same problem as "No Fun", or at least a similar problem. I've tried CUETools (latest version available in this topic - "Update 4") on one album I'm totally certain of : Alanis Morissette - Jagged Little Pill. This album was my absolute personal AccurateRip record a year and a half ago, with a confidence score of 181. So I'm quite certain it's a perfect rip, and a well-known one from AccurateRip's point of view. 01	 Disk not present in database. 02	 Disk not present in database. 03	 Disk not present in database. 04	 Disk not present in database. 05	 Disk not present in database. 06	 Disk not present in database. 07	 Disk not present in database. 08	 Disk not present in database. 09	 Disk not present in database. 10	 Disk not present in database. 11	 Disk not present in database. 12	 Disk not present in database. 13	 Disk not present in database. 14	 Disk not present in database. EDIT - Gregory, regarding the "Fix Offset" mode, personally I am interested in CUETools mainly for verification purposes. I'd like a tool that will help me batch-analyze all my CDs and write relevant AccurateRip info : AR info(accurate rip, different pressing, not present, not accurate), AR confidence score, etc... directly to the file tags, all in a single operation. E.g. : AR info tag = "Accurate Rip" and AR confidence tag = "181". Then with foobar I will easily locate all suspicious CDs and decide myself what to do with them (or not). What I want to say is that I too don't want CUETools to automatically perform conversions. I'd like it to only test the files, and then I'll decide what I want to do or not. An idea could be to include the "Verify Offset" feature into the "Verify" option. So with "Verify" we could (1) verify against the AR database with no offset correction, and (2) try other offsets if necessary then verify again. All this without conversion. @foorious: I checked freedb/Amazon and it looks like that hidden track was part of track 13, so I think you or whoever ripped it split it into a separate file. Oh, that's too bad : I have manually splitted hidden tracks in maybe 10 albums over more than 1000, and this seems to be one of them. Apologies ! I have tried rejoining tracks 13 and 14 using foobar, tested again, and the problem remains the same. Maybe I've manually removed the silence between both tracks, so I'd better pick another album. However, forgive me but I'm not sure to understand the results. E.g. : "01 [4e72a4c7] (200/229) Accurately ripped as in pressing(s) #1"
- What does the "200/229" mean ? - What does the "#1" mean ? And one last thing : how can we make the results to be written directly into the file tags ? Thank you again Gregory for this promising software. Gregory, regarding the "Fix Offset" mode, personally I am interested in CUETools mainly for verification purposes. I'd like a tool that will help me batch-analyze all my CDs and write relevant AccurateRip info : AR info(accurate rip, different pressing, not present, not accurate), AR confidence score, etc... directly to the file tags, all in a single operation. First of all, "Verify" option does verify offsets also. "Fix" option on the first pass does exactly the same as Verify, only it then procedes with conversion (possibly using the offset found in first pass). "Verify" also writes AR tags in source file on success, but currently only flac album image (with embedded cue) is supported for this. So as i see it, two features are missing: writing AccurateRip tags in image that is split into tracks, and special tags for non-offset corrected rips - because right now they are tagged as inaccurate. 200/229 is the confidence level, i.e. 200 of 229 people who ripped this disc got the same results as you. #1 means the first database entry. There are several entries for each disc in database. Is it #1 or #10, doesn't really matter. Anyway, only confidence level is important. Yes, definitely. These two features would be a great add-on ! - Be able to edit the name of each tag. Thanks. That's what I thought, but I prefer to be sure. Oh, just one question : if I add the confidence results for all different versions, I do not find 229. E.g. for track 1 : 200 + 2 + 5 + 2 + 8 + 4 + 4 = 225. Where are the 4 missing people ? I do not find 229. E.g. for track 1 : 200 + 2 + 5 + 2 + 8 + 4 + 4 = 225. Where are the 4 missing people ? The missing 4 people most probably had a scratched CD or bad drive, and ripped this disc with errors, so their CRC doesn't match even taking possible offsets into account. Right now Disk ID is the one and only way for AR. There's no text search in it. There's even no search by cddb id. And even if there was, for your Alanis Morissette disk, there are 70 entries in cddb database. I can't make the "encode if % of verified tracks with x confidence" mode work. FYI, I set AccurateRip mode to "Verify". I only enable the Encode check at Advanced options, with 100% and confidence=1. It verifies but it never encodes after that. While I'm at it, could you please add support to transfer tags while encoding ? I need to transfer APE tags to FLACs. Verify option still never outputs anything. "encode if" mode relates to "fix offset" option, which should probably be renamed now. You can uncheck the "fix offset if" option, turn on "encode if" option and use "fix offset mode". Support for APE tags is on my todo list. Thank you for the excellent new CUEtools features. I wonder if it would be possible to add a new simple filename extension corrector that would not need to check the audio files on the disk at all. Then you could just select the desired target extension (wav, flac, ape or wv) and mass process a bunch of cue sheets even if the audio files are not organized in separate folders. Personally, I have stored my "single file + cue" multi-disc albums in single album folders so I would need to reorganize them before I could use the filename corrector tool for fixing the cue sheets after a file format change. How is this possible? If I go and check offets page (http://www.accuraterip.com/driveoffsets.htm), it's clear that offset for "YAMAHA - CRW2100E" +733. Yet, accuraterip shows "Offsetted by 112" having confidence level 2? So this pressing is different by an offset value of 112? If your APE files have tags, i suppose they have embedded CUE sheets too? This kind of UI would allow any target extension. The tool would not require internal support for the compression format so it could be used when the audio files are converted outside CUETools. For instance, MP3 would be possible. It would be even better if it could optionally create a new cue file in the same location and preserve the original file. It could add the target extension in the new filename. For example, .cue could be changed to .mp3.cue (I use this naming system). 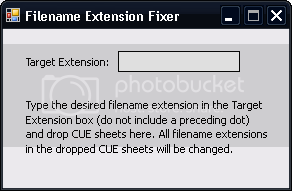 Personally, I always do a "copy, paste & rename" procedure before I change the extensions inside a cue file. It is a time consuming step if I have a lot of cue files to edit. Nope, just a single-album APE file, with APEv2 tags and a separate CUE file. Maybe it's a good idea to code a wrapper for Case's/Synthetic soul's tag.exe, since it's freeware and already does what we need. Cool. And i've been playing with x64 build. Got .APE files to decompress 25% faster.